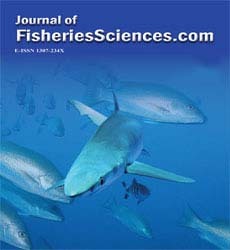 This study is conducted to determine the reliable method in ageing of Sprattus sprattus L., 1758 inhabiting Black Sea by investigation of bony structures and using length-frequency analysis. The results obtained from each methods were compared. Samples were collected from depths between 30 m and 150 m inside 3 miles offshore in November 2004, February 2005 and May 2005. Totally 1927 individuals were sampled and used length-frequency analysis. Age determination was also made in 301 specimens (108 female, 193 male) representing each length group. Vertebrae, opercles, subopercles, cleithra, scales and otoliths were removed from each individuals. Each bony structures were prepared for ageing by suitable techniques. After preliminary examinations; it was determined that the other bony structures except otoliths were not suitable for age estimation. Therefore, these bony structures were not evaluated in age analysis. Otoliths were read three times by binocular microscope. The percent agreement, the average percent error and the coefficient of variation were calculated from obtained age data and reliability of otoliths in age determination was investigated. In addition, age-length-weight relationships were examined by otolith age data. Consequently, it was reported that both otolith reading method and length-frequency anaysis were suitable for ageing this species.